The Constitution of the Republic of Kazakhstan permits the use of the death penalty for two types of offence: terrorist offences resulting in fatalities, and especially grave crimes committed in wartime. While a moratorium on the death penalty has been in place since 2004, since 2013, Kazakhstan has been considering a new Criminal Code, the current draft of which retains the death penalty as an option for all the offences that currently carry it. 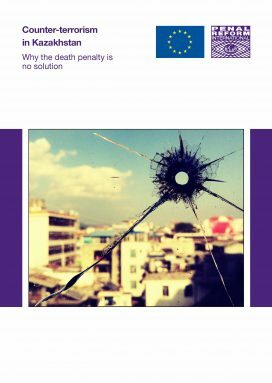 This report focuses on the death penalty for terrorism related offences, an issue that has exercised many countries. It looks at evolving standards and practice internationally and considers how Kazakhstan can meet its human rights obligations while countering terrorism and maintaining the security of its people. This report is available in English and Russian. We will also shortly be producing a short paper which focuses on the international law principles relating to the use of the death penalty for terrorism offences. The death penalty is retained for terrorism offences in many countries, but how does it conform with international standards?